Life Before the Dinosaurs: Coccosteus. Coccosteus is a Devonian arthrodire placoderm that resembles the larger Dunkleosteus. Coccosteus mainly lived in fresh water, but could have possibly also lived in the sea, like a bull shark in reverse. Fossils of Coccosteus have been found in Europe and North America. Coccosteus was usually about 8 to 10 inches, but the largest specimen is 16 inches long. Its name means "seed bone." 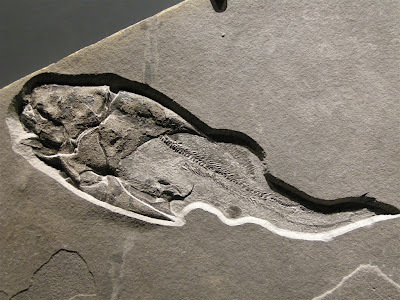 Like all other arthrodires, Coccosteus had a joint in its neck that would have allowed it to open its mouth wider than most fish and swallow larger prey. Coccosteus had a sharp beak which would have helped it slice open prey. It had bony plates covering its head which could have protected it from predators. Coccosteus lived from the middle to late Devonian Period. I might post a species of coelacanth on my blog, and I do have a picture of me posing with a dead coelacanth preserved in a tank of liquid. @Allison M.: I didn't know that! It *is* cool.